The city of Rome and the surrounding area is the one I did work the most, and the seemingly endless corridors of the Piramide metro and train station, it would be possible to have some fun with the languorous kissing possible on the rolling sidewalk, when it’s not broken! I've plenty of suggestions and recommendations also if you're planning to have your wedding in Rome. People come from all over the world have their wedding in Rome because of the weather, the architecture and the culture, and the food. I was living in Rome and, despite the fact that city it's really a mess about organisation, despite it's overcrowded. I miss the good weather, the sea at 15min, the jokes, the food, and the history and the art, the culture and the architectural beauty, in Rome you're surrounded by it, always. Rome has thousands of churches, hundreds of villas, thousands of square meters of gardens, thousands of restaurants and hundreds of wedding planners, floral designers and make-up artists etc. Rome is the best choice to fulfill every taste! It just depends on the style and mood you'd like and your wedding in Rome will be unique. Don't waste your time! Despite this huge amount of people based in Rome and working in the wedding business, if you're planning to be married in Rome, the URBS AETERNA, be aware the best venues need to be booked (at least) one year in advance. Very, very often we receive questions about "Where to go for a wedding reception around Rome? Which would you recommend?" It depends on the number of guests if you'll like to have it indoor or outdoor, your tastes actually. This is a list of locations I've got in mind right now and I've been to, I'm very glad to recommend them all for a wedding. Roof Garden Rome Cavalieri, Palazzo Brancaccio, Casina Valadier, Castello di Nerola, Castello di Tor Crescenza, Villa Aurelia, Palazzo Manfredi, Terrazza Caffarelli, Hotel De Russie, Hotel Hassler, Ristorante Mirabelle, Hotel Quirinale (I guess this is one of the best as very central and not too expensive), Ristorante Aroma (this is right in front of the Colosseum), Les Etoile (this is close to S. Peter and the Vatican), Villa Rosa Antica, La Porta del Principe, Antico Granaio, Scuderie San Carlo, Scuderie Odescalchi, Hotel Exedra, Antico Melograno, there's many, many more but I can't remember them all at the moment, write me to better understand your needs and I'll be glad to help you to find the one which better fit your tastes and needs. There are thousands of restaurants in Rome, the most romantic and interesting restaurant in Rome, in my honest opinion is "Taverna Dei Mercanti". Very important logistic note: the traffic jam in Rome is something you can't just ignore or forget planning your wedding in Rome. Every day there's a manifestation, a strike, a concert, a festivity or recurrence, Jubilee year, a fashion show, United Nation meeting, Prime Minister meeting with F.A.O. everything related to Italy happens in Rome! Do not underestimate the time you may need to reach your church or your venue, please. 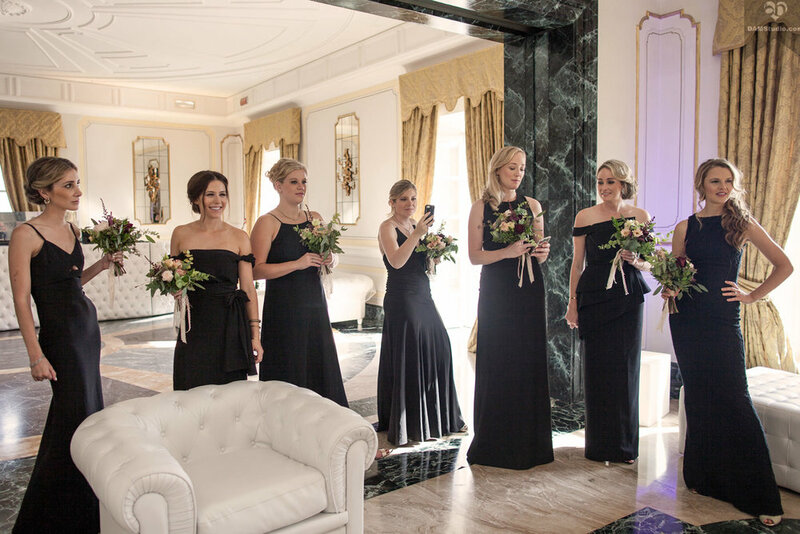 In my personal and humble opinion, the best choice for a wedding in Rome, is to getting ready at Rome Cavalieri Waldorf Astoria and to have the reception (and ceremony too, if you'll like to) at Villa Miani. First of all the services they offers and their position are both amazing, Monte Mario is a kind of hill on the top of Rome, you can see all the city from there spot, it's close to Gianicolo. They're directly connected each other. If you'll be getting ready in the hotel, you'll have just to walk downstairs, pass the gallery which leads to the tennis fields and you'll be straight into Villa Miani (in the pictures below). For you who dream of being as famous as Giulio Cesare, here’s your chance for photographic fame! All you have to do is stand between the Colosseum and a few camera-happy tourists :) They may even appreciate to have a slow motion footage of you two kissing there :D Anyway, I’m receiving this question very often: where will we able to take wedding pictures? You won't believe how many beautiful spot there's in Rome to take wedding pictures and how many hours (if not days!) 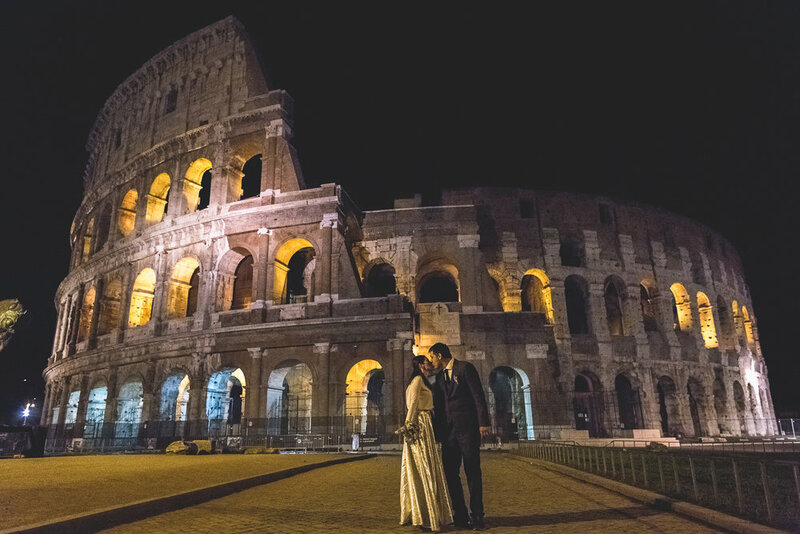 we may spend taking pictures around Rome during your wedding! For each one of these places, we have a kind of standard, funny or creative pictures we can take, based on the time of the day, based on your mood and also based on our long experiences, of course. weather conditions, as in case of rain, many of them aren't recommended, few of these locations are quite close each other, actually 5min walking but few may require more than 15min by car, few are into Traffic Limited Zone (which require special permissions to go in), few of them may be "wrapped" or under reconstruction, on the day you'll love to take pictures, for restoration, note also the sea isn't far from Rome at all so we may evaluate to take wedding pictures on the beach during your wedding in Rome. Monte dei cocci - Catacombs - Villa Doria Pamphili Park - Villa Ada Park - Villa Celimontana Park - Limonaia of Villa Torlonia - Via Tagliamento & Piazza Buenos Aires. -Villa Adriana & Villa d'Este in Tivoli (1h by car from Rome center but very interesting and different each other). Choose the one you'll prefer and we'll promise you'll have awesome pictures! Couples often complain the city center is overcrowded and a wedding in Rome is affected by traffic jam, creating delays. You may need hours to go to the other side of Rome during rush hours and reach the best spots to take pictures may be difficult too. There's always a huge amount of tourists at Colosseum, around St. Peter church and Vatican square, at Campidoglio and Roman Forums, Piazza di Spagna and Trevi fountain. It did really happen to me to go there in June, to take pictures with the newlyweds, and there were 9 brides at the Colosseum, at the same time, on a Saturday afternoon. That's why Ivanka & Peter choose to have their wedding pictures around Rome by day.. and by night too! Finally we had all the main spots just for us! We had had to wake up really early but we did enjoy this wedding photo session by night in Rome very much! 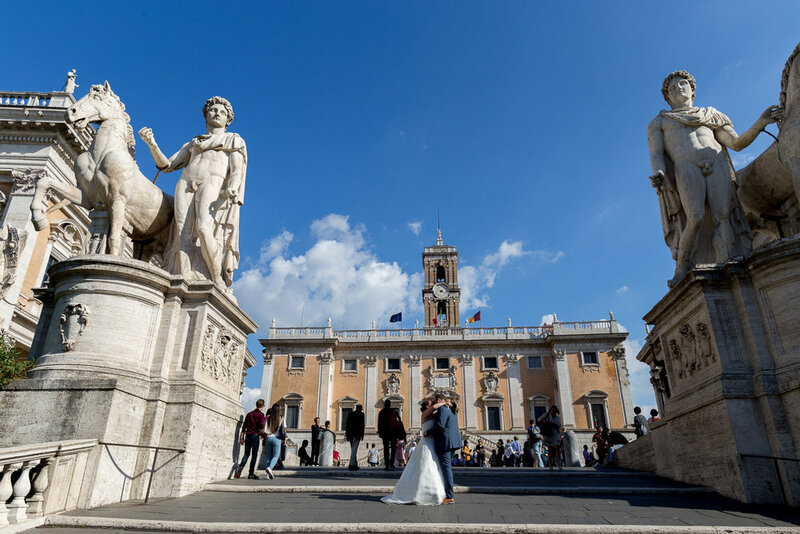 Many couples come to Rome and choose their state's embassy to have their wedding ceremony in Rome. 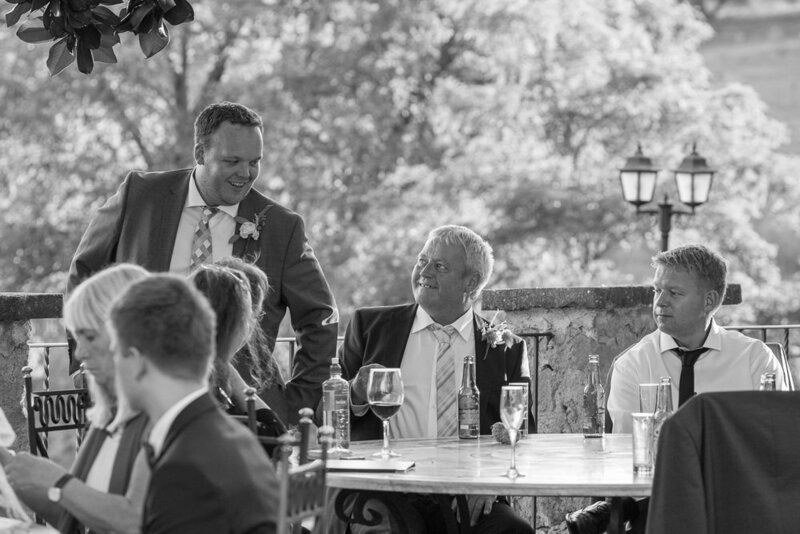 Hege & Christian had their wedding in Rome at the Norwegian embassy in Rome. After getting ready at the Castello della Castelluccia, they took a bus to the center with all the guests. After that, we went back to the Castelluccia Castle, for the aperitif and the reception. They already have got 3 children and the last one was born just a few weeks before, so as all the guests had a seat and start to have the dinner, she went to breastfeed the child. It was a very beautiful and intimate moment for me, I always want to be discreet and I didn't want to interrupt that moment. Despite that, I had so big wish to capture it, for her, to allow her to have a memory of that beautiful moment, so I did ask her permission and I took that picture, which I won't show you. Other two very luxury venues near Rome are Villa Aldobrandini and Castello di Bracciano. The first it's located in the city center of Frascati, which is approximately 30min far from Rome and it's really so beautiful that it's seems to be a kind of museum; please give a glance to this gorgeous wedding we did the video there. Alexandra & Georges choose to have their pre-wedding at Castello di Bracciano, with medieval flags show, medieval fire show and medieval dance show from the past, so that you really feel the history there! Which is your favorite venue for a wedding in Rome? Which church or spot is still in your mind and probably in your heart too for your wedding in Rome? As a wedding photographer, I've seen a lot of beautiful venues all around Italy and wherever you will choose to go, don’t let your wedding photography to chances! "Rome wasn't built in a day "is an adage attesting to the need for time, to create great things". 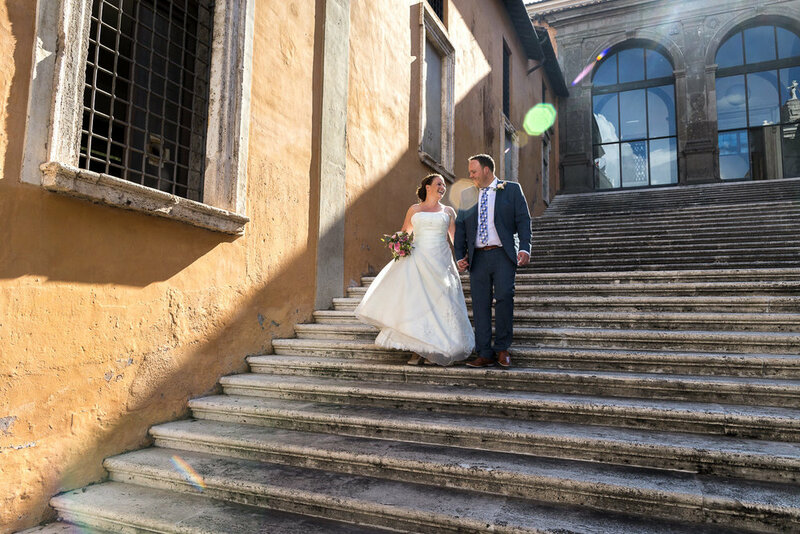 My wedding photography style is photojournalism which is very discreet and creative, I’ve done hundreds of weddings in Rome with couples of every culture and arriving from every country, and I’m completely at your disposal to talk about your wedding in Rome. Write me please just your wedding date, to check if I'm still available, and I'll be your best help and best friend for your wedding day in Rome.